The big granddaddy of it all, the Commercial Tasting is the anchor and highlight of Big Beers, Belgians & Barleywines Weekend. 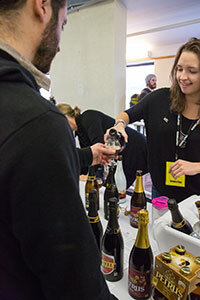 Sample over 500 big (over 7% abv), Belgian in style, and experimental beers throughout the afternoon. As you sample, visit with the brewery owners, brewmasters, and importers, learning more about their craft and inspsiration. Some were created especially for Big Beers! Taste beers from over 135 breweries and importers in your commemorative tasting glass, hydrate from convenient water stations, and use your complimentary food coupon to stay grounded during this high altitude event. Don't miss the homebrew competition awards at 3:30pm in the Colorado Ballroom foyer! From the official website- The Commercial Tasting on Saturday afternoon has been dubbed “one of the best collections of beer ever seen in one place.” This international slice of beer is extremely diverse; Belgians, lambics and sours highlight the lighter end of the spectrum, while the Barleywines and Strong Ales dominate the other, with specialty beers from some of the most creative commercial brewers in the world. As has become traditional, the Commercial Tasting will begin at 2:30 pm in the afternoon, following a variety of educational beer and brewing seminars that you can attend with your ticket.